o you remember when Gatlinburg was a quaint, quiet little place? At Hippensteal’s Mountain View Inn, it still is! The driveway turns left off Grassy Branch Road and the signs welcome you. The pleasant half-mile drive to the top that winds past meadows and other homesteads doesn’t prepare you for the view that awaits after the last turn. 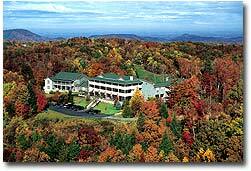 At the top of the mountain, the breath-taking panorama that stretches from Greenbriar Pinnacle to Mt. Harrison–with the majestic Mt. LeConte in the middle–greets the visitor. 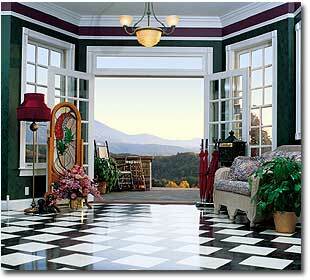 And the Inn has three wrap-around porches from which you can enjoy the majestic views . he Hippensteal Mountain View Inn is an eleven-bedroom bed and breakfast designed, built, and decorated by Vern and Lisa Hippensteal. The large porches invite you to come and relax in the rocking chairs under ceiling fans to watch the Great Smoky Mountains as they change minute by minute. Inside, the black and white tiled floor of the lobby, comfortable wicker furniture, and ambient lighting make the visitor feel he or she has stepped into the past. The large stone fireplace compels one to sit and relax. The breakfast room is elegantly decorated with marble-top tables, wicker chairs, and fine linen and is situated so guests can dine while watching the clouds dance across the mountains or the flames in the great stone fireplace.The kitchen is spacious and during the morning hours the aroma of breakfast fills the Inn. The Hippensteals are famous for their breakfast, which includes dishes like sausage pie, cheese soufflé, homemade bread cheese melts, and sausage pinwheels. Lisa’s fresh apple-raisin breads and pumpkin-chocolate breads are wonderful. Guests are always welcome in the kitchen, where coffee, teas, and fresh fruit are always available. In the evening, a special dessert is prepared to beckon the traveler home. ern Hippensteal is one of the area’s leading watercolorists, and the Inn also serves as a gallery for Vern’s works (in addition to the two other galleries in Gatlinburg). The hallways and lobby area are filled with his limited-edition prints already framed and available for purchase. His studio is on the second floor, just off the library. Each of the eleven bedrooms has its own special character and is named after a painting hanging over the mantle of each room’s fireplace. For example, the room named “After the Rains”, with its colorful flowered wallpaper and handmade linens, is complimented by Vern’s painting of a rainbow over the Smokies. A King bed, reading chair, television, and radio contribute to a comfortable stay. 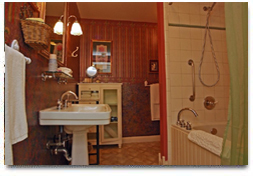 Each bedroom has its own private bath, with pedestal sink and oversized whirlpool tub. Views of Mt. 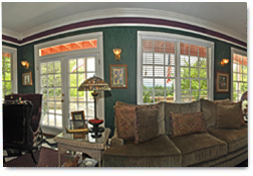 LeConte fill the windows of each bedroom, and guests only have to step onto the wide porch to enjoy the full splendor. 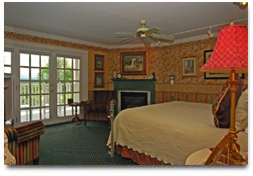 isa, who grew up at the original Mountain View Hotel, is the daughter of Tom and Jane Woods, and brings both the experience from that hotel background plus a natural warm hospitality to the Hippensteal Mountain View Inn. 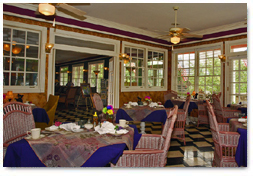 She hopes their son, Woods, experiences the wonderful memories she has of guests at the original hotel. The Hippensteal Mountain View Inn is part of the Great Smokies Arts and Crafts Community, a collection of over 60 individual art galleries, craft shops, tearooms, and inns. The Inn is only minutes from downtown Gatlinburg, Ober Gatlinburg, the Greenbriar entrance to the Great Smoky Mountains National Park, Pigeon Forge and Dollywood. $194.00 per couple per night and $50 for a third person, which includes a full breakfast. The Inn is located on Grassy Branch Road. From downtown Gatlinburg, turn at traffic light No. 3 onto Highway 321 N/73 E towards the Gatlinburg Arts and Crafts Community. Light Number 3A onto Glades Road. This begins the Gatlinburg Arts and Crafts Community. Follow Glades Road 3.3 miles until it ends, then turn left onto Birds Creek Road, go .4 mile to an intersection and then go right up and over the hill (.2 mile). At the “Y” go right .6 mile and our driveway is on the left.